I’ve built and rebuilt more gaming PCs than is probably healthy, but I could never afford to include a decent surround-sound system. I’m not talking only about the price, either—years of living in city apartments with paper-thin walls have made me exceedingly cautious of offending neighbors (and landlords) who have sensitive ears. Last year I finally caved and started using headphones that emulate a virtual 5.1 speaker system, because most contemporary games are built to take advantage of surround sound—if you’re limiting yourself to using stereo cans, you’re missing out. But if you aren’t willing to shell out hundreds of dollars for a fancy gaming headset just yet, Razer’s new Surround software might be just what you need. Razer Surround emulates a virtual 7.1 surround-sound setup in any pair of stereo headphones, and it’s free to use—for now. Razer Surround works through Razer’s Synapse 2.0 utility, so you’ll have to register for a Razer account and download the requisite software before getting started. 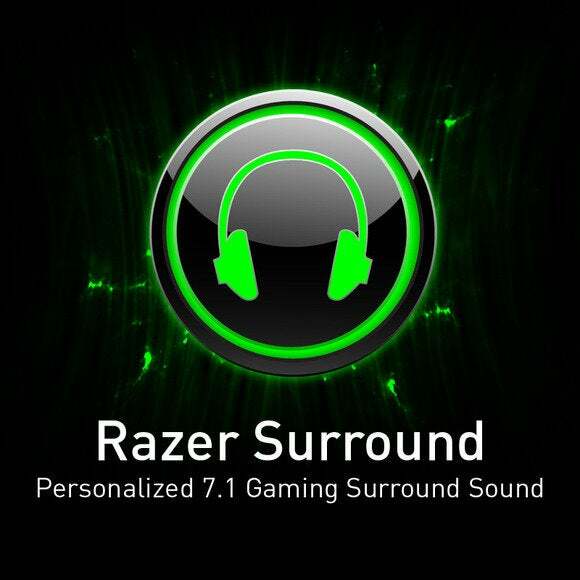 When you finish installing Razer Surround on your PC, the software creates a virtual sound card (called the Razer Surround Audio Controller) that accepts surround-sound data from whatever is running on your PC—games, movies, or music—and emulates it virtually on a pair of stereo headphones. 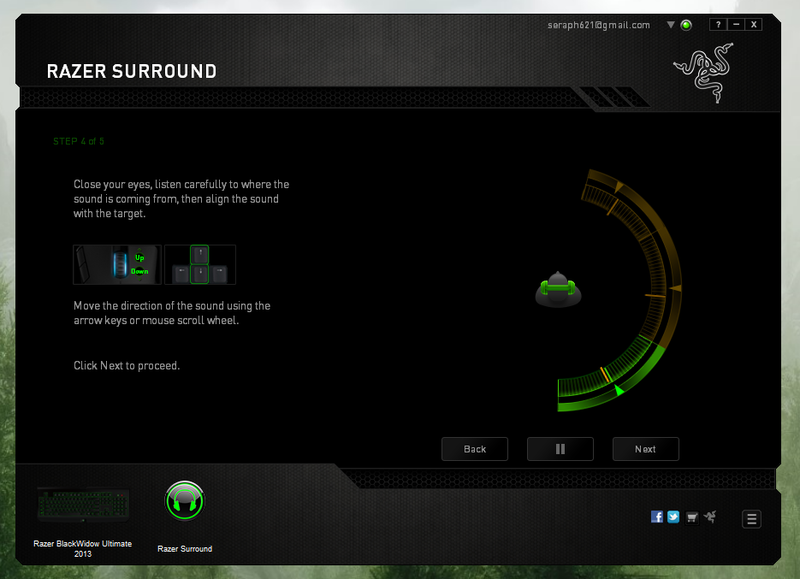 Razer Surround is a virtual sound card that you can customize via the Razer Synapse software. Log in to Synapse, and ‘Razer Surround’ should appear on the list of Razer peripherals attached to your PC. Click that entry, and you’ll run through a simple calibration process that lets you tailor the positioning of the emulated surround sound to your preferences. The calibration process itself is a little confusing: You have to look at a diagram of where a given sound effect is meant to emanate from, and then close your eyes and adjust the effect’s positioning with your mouse wheel until it sounds like it’s coming from the correct spot. Calibrating the 7 quadrants of this virtual 7.1 surround-sound arrangement is simple enough: Look at where the audio is supposed to be originating, and then adjust the settings until the sound seems to come from that location. After completing the calibration process, you can run through a few demos to verify that you’re now simulating decent surround sound in your two-bit stereo headset. In my tests Razer Surround worked well with a pair of Sony MDR-V6 stereo headphones, breathing life into the crowd scenes of Metro: Last Light by making it sound as though different conversations grew louder or softer as I rotated my character’s head and moved through the tunnels. If you play with a gaming headset that has a mic attached, Surround lets you adjust the volume level of in-game voice communication and fiddle with a “presence level” setting that supposedly clarifies incoming voice messages with a special audio filter. 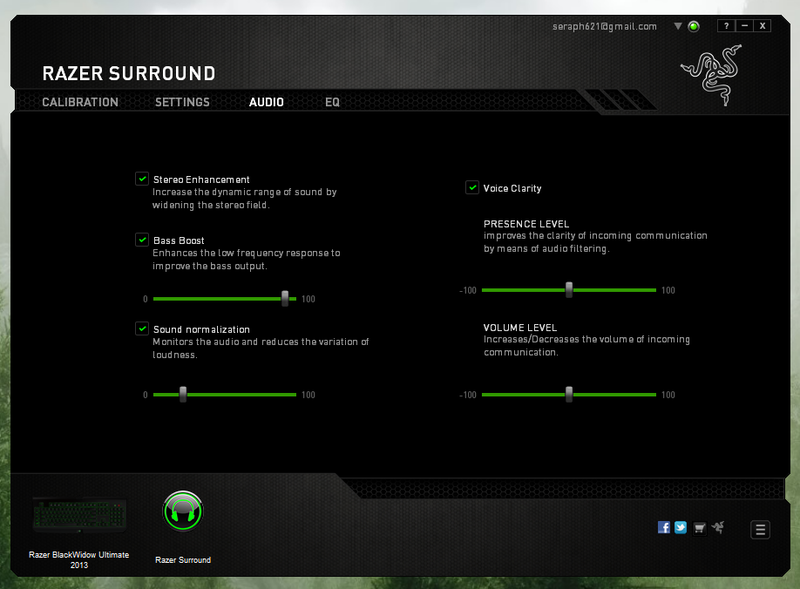 Razer Surround seems most noticeable when you simply listen to music on the desktop. After calibrating the software, you can adjust a virtual equalizer via Razer Synapse and tinker with audio options such as virtual bass boosting and stereo enhancement. While writing this story, I put Surround through its paces with a Spotify playlist that oscillates between Daft Punk and Bill Withers, but pretty much everything sounded better when I took the time to flip between Surround’s EQ presets. Virtual surround-sound in games is all well and good, but the bass boost is my favorite part of Razer's new audio software. 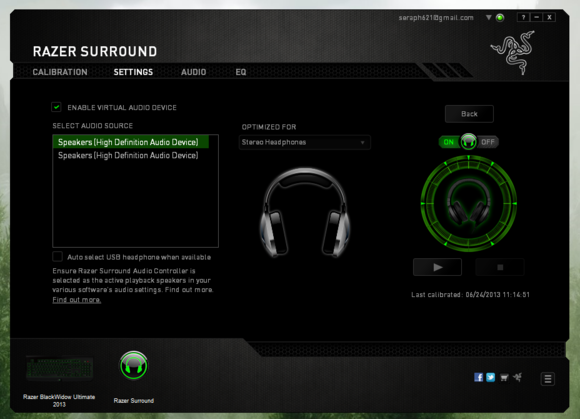 Razer Surround is free to use—for now. Razer is making the software available for download at no charge through the end of the year, though the company encourages users who like the software to donate money to the Child’s Play charity. Next year (starting on January 1, 2014), new users must pay $20 to sign up for Razer Surround. Razer Surround works with every version of Windows from XP onward; so if you’ve been living in stereo, grab it now to get a taste of what you’ve been missing.